These Mexican-inspired crab cakes are flavored with chipotle chilis and topped with a sauce of tomatillos and avocado. Place the crabmeat in a large mixing bowl. Add the eggs, mayonnaise, celery, red pepper, sweet onion, cilantro, lime juice, chipotle pureé and salt. Combine thoroughly, then add the panko crumbs in 1/2 cup increments until the mixture reaches a consistency that will hold together when formed into patties. 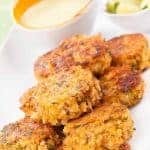 To form the crab cakes, gently pack some of the mixture into a 1/3 cup measure that has been sprayed with nonstick coating. Turn it upside down and tap gently until the formed crab cake comes out; then, using your hands, gently firm the patty and place on a plate. Repeat with the remaining crab mixture and refrigerate the formed patties for 30 minutes to one hour. While the crab cakes are chilling, make the sauce. Heat the vegetable oil in a large skillet over medium heat. Add the onion, garlic and jalapeños and sauté until fragrant, about 1 minute. Add the tomatillos and salt and simmer until the tomatillos soften and break down and the mixture thickens (about 12 to 15 minutes). Transfer to a shallow dish and set aside to cool. In a small bowl, toss the cubed avocado with the lime juice and 1 tablespoon of the cilantro and set aside. Heat the 2 tablespoons vegetable oil in a large skillet over medium-high heat. Add half of the crab cakes in a single layer and cook until golden brown, about 3 minutes on each side. Transfer to a serving platter and keep warm while cooking the remaining crab cakes. To serve, combine the avocados with the tomatillo mixture, then spoon a small amount of the sauce on top of each crab cake. Put the the balance of the sauce in a serving bowl. Garnish the crab cakes with the remaining cilantro if desired. The quantity of chipotle pureé we used in this recipe lends a very mild heat and smoky flavor that doesn’t conflict with or overpower the flavors in the sauce. If you think you’d prefer a bit more heat, try adding a finely chopped jalapeño to the crab mixture rather than additional chipotle pureé in order to keep the dish in balance.